On Friday 28th April 2006 Willie Richardson, a respected elder of the St. Louis blues playing fraternity, died of pancreatic cancer. Very much an �underground figure� outside his home community Willie was born October 1935 and raised on a plantation in Omaha, GA. He grew up listening to the music of Hank Williams, Faron Young and a host of others on the Grand Ole Opry because �that was the only kind of music you could get on the radio in that part of the country�. The blues and gospel music he learnt from house parties and church meetings. In his late teens he joined the famous gospel group The Blind Boys of Alabama as their guitarist and in 1955 he left them and moved to St. Louis. Here he met the brilliant harmonica player Big George Brock the owner of the Club Caravan who invited him to join his house band. It was at the Club that he befriended and began playing with various members of the Ike Turners Rhythm Rockers with whom he travelled to the Sun Studios in Memphis to record. Returning to St. Louis in 1967 Willie formed his own group which at various times included Jackie Brenston, Bubber Brown and the soul singer Charles Drain. They played the Tic Toc Club for four years while at the same time working as the house band for the famous Dave Dixon�s Talent Show. This band recorded for RCA under the name of Charles Drain and two singles were released. The blues soul scene in St. Louis then went into decline and Willie and the band played fewer gigs outside of a long residency at The Red House (which he still plays today) and he concentrated on his day job with the telephone company. Another recording was made in 1985 for Professors 50/50 Label again under Charles Drains name but nothing happened. At some point Willie found that the blues was back in vogue with the band finding regular work at Cleo�s Bar and other �hole in the wall� residences. He also set up his own recording studio which apart from his own recordings has laid down tracks by George Brock, Eugene Fluker, Johnny Jones and Blues Boy Bubba. Willie Richardson�s music was that of the numerous unknowns and forgotten blues musicians who play for appreciative local crowds in neighbourhood clubs, bars and juke joints throughout America. 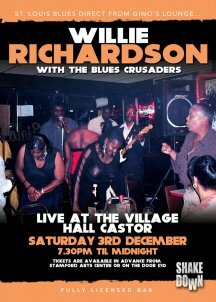 On the 3rd December 2005 we tried, with great success, to recreate the atmosphere of his Sunday night residency at Cleo�s Bar in St. Louis together with the Shakedown House Band The Blues Crusaders (Jeremy Watson, Gtr: Jamie Goodwin, Hammond: Bruno, Bass and Rick Hudson, drums) Recordings were made Live at The Village Hall, Castor which confirm that it was not only the beer that made the evening so enjoyable. He had not been well for some months before travelling to England having lost some 80lbs in weight which the doctors had diagnosed as a stress related stomach ulcer. On his return to the States it was found that his condition was much more serious. Sometime earlier this year Willie was married to his partner Margaret Saunders and our condolences go out to her and to his children. n.b. The above biography was put together from conversations with Willie in Castor.